Vail Resorts Closes Its Acquisition of Okemo Mountain Resort, Mount Sunapee Resort and Crested Butte Mountain Resort | Vail Resorts, Inc.
BROOMFIELD, Colo., Sept. 27, 2018 /PRNewswire/ -- Vail Resorts, Inc. (NYSE: MTN) today announced that the Company has closed on its acquisition of Triple Peaks, LLC, the parent company of Okemo Mountain Resort in Vermont, Mount Sunapee Resort in New Hampshire and Crested Butte Mountain Resort in Colorado. The Company purchased Triple Peaks from the Mueller family for a final purchase price of approximately $74 million, after adjustments for certain agreed-upon terms. As part of the transaction and with funds provided by Vail Resorts, Triple Peaks paid off $155 million in leases that all three resorts had with Ski Resort Holdings, LLC, an affiliate of Oz Real Estate. Okemo Mountain Resort and Mount Sunapee Resort join Stowe Mountain Resort in Vail Resorts' northeastern network of resorts, providing even more options for skiers and snowboarders in the region. Okemo, approximately three hours from Boston and four hours from New York City, sits just above the Vermont village of Ludlow and has developed a reputation for superior guest service, incredible snow quality, grooming, terrain parks, and family programs. Mount Sunapee, located in the Mount Sunapee State Park, is the premier ski area in southern New Hampshire and is just a short 90-minute drive from Boston. The four-season, family-focused ski area has breathtaking views overlooking Lake Sunapee and consistently receives accolades for excellence in snowmaking and grooming. With the addition of Crested Butte to Vail Resorts'Colorado network, pass holders now have access to up to seven world-class resorts throughout the state, including Vail, Beaver Creek, Breckenridge, Keystone, Arapahoe Basin, and Telluride. Crested Butte Mountain Resort is located in southwest Colorado's Grand Mesa Uncompahgre and Gunnison (GMUG) National Forests and is known for the colorful and historic town of Crested Butte, renowned mountain peaks, and legendary skiing and riding terrain. "We are thrilled to offer pass holders even more one-of-a-kind experiences in the northeast and in Colorado with the addition of Okemo, Mount Sunapee and Crested Butte to our network of world-class resorts," said Kirsten Lynch, chief marketing officer of Vail Resorts. "Unlimited, unrestricted access to these resorts through the Epic Pass, Epic Local, and Military Epic Pass, as well as access on the Epic 4 Day and Epic 7 Day, will be a tremendous benefit to skiers and snowboarders." Today's acquisition closure on Triple Peaks, LLC, is the second of two acquisitions announced in June 2018 to be finalized. In the first, separate transaction, which closed on Aug. 15, Vail Resorts announced the acquisition of Stevens Pass Resort in Washington from Ski Resort Holdings, LLC, an affiliate of Oz Real Estate. Less than 85 miles from Seattle and renowned for its plentiful snowfall, the resort sits on the crest of the Cascade Range within two national forests – the Mt. Baker-Snoqualmie National Forest on the west side, and the Wenatchee National Forest on the east. Following today's closing, Vail Resorts plans to invest $35 million over the next two years across the four resorts to continue to elevate the guest experience. In addition, annual ongoing capital expenditures are expected to increase by $7 million to support the addition of these four resorts. Epic Pass™: For $929, the Epic Pass offers unlimited, unrestricted access to 19 mountain resorts plus additional access to 46 more, including 20 new mountains for the 2018-19 season. Discover 65 of the world's premier resorts throughout the United States, Canada, Australia, Japan, France, Switzerland, Italy, and Austria. The Epic Pass pays for itself in just over four days of skiing or snowboarding. 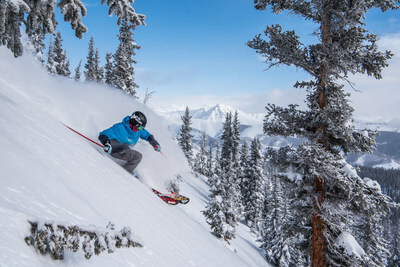 Enjoy unlimited, unrestricted access to Vail, Beaver Creek, Breckenridge, Keystone, Crested Butte and Arapahoe Basin in Colorado; Park City in Utah; Heavenly, Northstar and Kirkwood at Lake Tahoe; Stowe and Okemo in Vermont; Mount Sunapee in New Hampshire; Stevens Pass in Washington; Afton Alps in Minnesota; Mt. Brighton in Michigan; Wilmot Mountain in Wisconsin; Whistler Blackcomb in Canada; and Perisher in Australia for the 2019 season. New for the 2018-19 season, Epic Pass holders will receive seven days of skiing or snowboarding with no blackout dates at both Telluride in Colorado and at Resorts of the Canadian Rockies (Fernie Alpine Resort, Kicking Horse Mountain Resort and Kimberley Alpine Resort in British Columbia, Nakiska in Alberta, and Mont-Sainte Anne and Stoneham in Quebec), in addition to five total consecutive days with no blackout dates at Hakuba Valley's nine ski resorts in Japan. The Epic Pass also grants limited access to Les 3 Vallées, Paradiski and Tignes-Val D'Isere in France; 4 Vallées in Switzerland; Arlberg in Austria and Skirama Dolomiti in Italy. A child pass (ages five to 12) is $479. Epic Local Pass™: For $689, guests receive access to 27 resorts, including unlimited, unrestricted access to Breckenridge, Keystone, Crested Butte, Okemo, Mount Sunapee, Stevens Pass, Arapahoe Basin, Wilmot, Afton Alps and Mt. Brighton with limited restrictions at Park City, Heavenly, Northstar, Kirkwood, and Stowe, plus a combined total of 10 days at Vail, Beaver Creek, and Whistler Blackcomb with holiday restrictions. The Epic Local Pass pays for itself in just over three days. New for the 2018-19 season, Epic Local Pass holders will receive access to 13 new mountains including Crested Butte, Okemo, Mount Sunapee, Stevens Pass plus five total consecutive days with no blackout dates at Hakuba Valley's nine ski resorts in Japan. A child pass (ages five to 12) is $369. Military Epic Pass: In celebration of the 10th anniversary of the Epic Pass on March 18, 2018, Vail Resorts is honoring the epic service of the Company's founders from the U.S. Army's10th Mountain Division, and the men and women of the U.S. Armed Forces, Canadian Armed Forces and Australian Defence Force with the introduction of a new $129Military Epic Pass for active and retired military personnel and their dependents – more than an 85-percent off the regular Epic Pass price. Additionally, as the first of its kind in the mountain resort industry, all other U.S., Canadian and Australian veterans and their dependents are eligible for a $529Military Epic Pass, which offers more than a 40-percent discount off the regular price ($289 for children under 18 years of age). Vail Resorts will donate $1 for every 2018-19 season pass sale to Wounded Warrior Project® to benefit wounded veterans and their families, which would exceed $750,000 based on last year's sales. Visit www.epicpass.com/military for all details on military pass options. Statements in this press release, other than statements of historical information, are forward-looking statements within the meaning of the federal securities laws, including our expectations regarding capital investments across the four resorts over the next two years. Readers are cautioned not to place undue reliance on these forward-looking statements, which speak only as of the date hereof. All forward-looking statements are subject to certain risks and uncertainties that could cause actual results to differ materially from those projected. Such risks and uncertainties include but are not limited to prolonged weakness in general economic conditions, including adverse effects on the overall travel and leisure related industries; unfavorable weather conditions or the impact of natural disasters; willingness of our guests to travel due to terrorism, the uncertainty of military conflicts or outbreaks of contagious diseases, the cost and availability of travel options and changing consumer preferences; the seasonality of our business combined with adverse events that occur during our peak operating periods; competition in our mountain and lodging businesses; high fixed cost structure of our business; our ability to fund resort capital expenditures; our reliance on government permits or approvals for our use of public land or to make operational and capital improvements; risks of delay associated with governmental and third party approvals of the transactions; risks related to a disruption in our water supply that would impact our snowmaking capabilities and operations; risks related to federal, state, local and foreign government laws, rules and regulations; risks related to our reliance on information technology, including our failure to maintain the integrity of our customer or employee data; our ability to hire and retain a sufficient seasonal workforce; risks related to our workforce, including increased labor costs; loss of key personnel; adverse consequences of current or future legal claims; a deterioration in the quality or reputation of our brands, including our ability to protect our intellectual property and the risk of accidents at our mountain resorts; our ability to successfully integrate acquired businesses or that acquired businesses may fail to perform in accordance with expectations, including Whistler Blackcomb and Stowe or future acquisitions; our ability to satisfy the requirements of Section 404 of the Sarbanes-Oxley Act of 2002, with respect to acquired businesses; risks associated with international operations; fluctuations in foreign currency exchange rates, particularly the Canadian dollar and Australian dollar; changes in accounting estimates and judgments, tax law, accounting principles, policies or guidelines or adverse determinations by taxing authorities; a materially adverse change in our financial condition; and other risks detailed in the Company's filings with the Securities and Exchange Commission, including the "Risk Factors" section of the Company's Annual Report on Form 10-K for the fiscal year ended July 31, 2017, which was filed on September 28, 2017, and the "Risk Factors" section of the Company's Quarterly Report on Form 10-Q for the fiscal quarter ended January 31, 2018, which was filed on March 8, 2018.